Below are the images of the actual printed pages. Please scroll below for the excellent translation by local Concierge, Jaycee McCreary. Thank you Jaycee!! 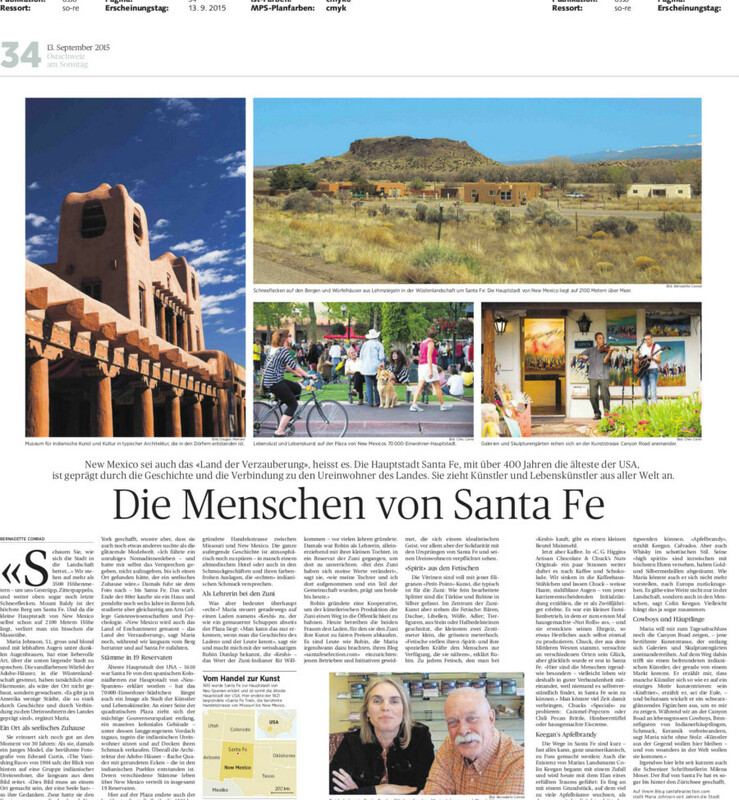 A small shot of the Sudkurier Travel & Leisure page, including images. A small shot of the page shown in Ostschweiz am Sonntag. Images: Adobe houses (Lehm house, left photo) are typical for Santa Fe. Maria Johnson and Nicholas Ballas (middle photo) enjoy living there very much. Canyon Road, an artist’s street, is a highlight of the city (right photo). The city in the US state of New Mexico is more defined than any other in America through its indigenous peoples. Look how the city beds itself in the landscape… We are standing at more than 3500 meters in altitude – around us scrub, aspen, and higher up even still some last snowflakes. Mount Baldy is the highest mountain around Santa Fe. Because the little capital of New Mexico already stands at 2100 meters, one loses a bit of the magnitude. Maria Johnson, 51, tall, blonde, and with lively eyes under dark eyebrows, has a loving nature in which she speaks of the city that lies about her. The sand-colored dice which are the adobe houses strewn about the desert landscape really evoke a harmony, as if the place was not built, but rather evolved. “There are few cities in America that are as strongly defined through history, and through the connection to the indigenous peoples of the land”, added Maria. She still remembers the moment 30 years ago quite well: When she was a young model, she saw the famous photos of Edward Curtis “The Vanishing Race” from 1904. It shows a long ago glimpse of Indian inhabitants who ride slowly out of the picture. “This picture must be made in a place that has soul”, such are her thoughts. Thus, she moved her career from England to New York, knowing that she was seeking something other than the glitzy world of modeling. “I was leading an unquiet, nomadic life, and promised myself that I wouldn’t give up until I found a place to live that would be filled with soul.” At that time, she traveled to where the photo was found – to Santa Fe. That was that. At the end of the 1980s, she purchased a home, continued to work as a model, and at the same time studied psychology and humanities at the college of arts. “New Mexico is also called ‘the land of enchantment’, said Maria as we slowly made our way down the mountain and towards Santa Fe. It is the oldest capital in the USA. In 1610, Santa Fe was declared to be the capital of “New Spain” by Spanish colonialists. Today, the little city with a population of 70,000 inhabitants has been long known as a city of artists. The mighty Governor’s Palace, a massive colonial building, lies along one side of the square plaza. The Indian inhabitants sit on blankets under the long canopy day in and day out, and sell their jewelry. Overall, the architecture of the adobe houses is flat walled with rounded corners, in the style of the Indian pueblos. There are 19 pueblos throughout New Mexico. The famous “Santa Fe Trail” also ended there at the plaza. It was a trading route between Missouri and New Mexico that was founded in 1821. One can still feel the entire, exciting history in the atmosphere – in some old-fashioned hotel or also in the shops with colorful wares, accented by authentic Indian-made jewelry. “What does ‘authentic’ actually mean?” Maria steered us towards a shop named “Keshi”, which means “welcome” in the Zuni Indian language. A painted sign alongside the plaza reads “One can only understand if he knows the story of the shop and the people”. She introduced me to the white-haired Robin Dunlap, who founded Keshi many years ago. At that time, Robin was a teacher, who while raising her daughter, went to Zuni pueblo to teach. “My worth changed through the Zuni people”, she said, “as my daughter and I were taken in and we became part of the community, and this has defined who we are still today.” Robin founded a coop as a way of making Zuni art more public. Today, the two ladies run the shop, and are able to obtain fair prices for the Zuni people. 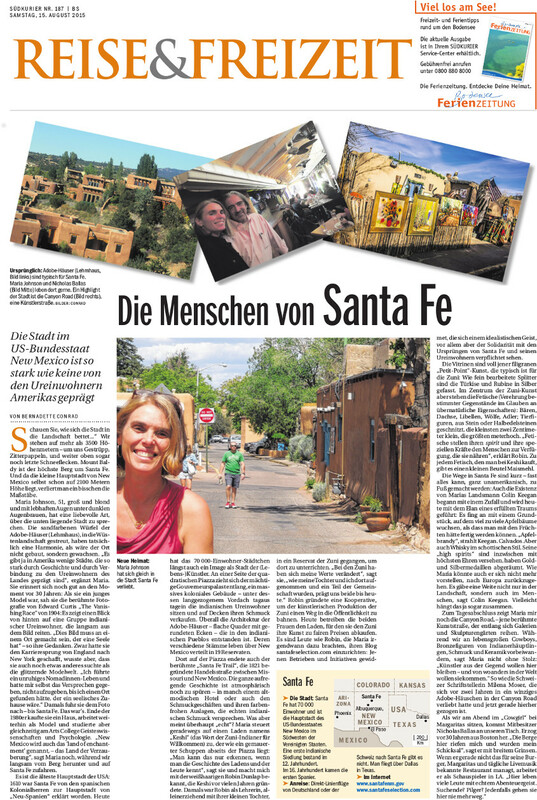 It is those people like Robin that Maria brings to her blog santafeselection.com; those who are dedicated with initiative to their operation, those who before anything oblige themselves to have solidarity with the origins of Santa Fe and its inhabitants, and to do so with a soul-filled spirit. The windows are full of filigreed “petit-point” art, which is typical of the Zuni. Like finely worked splinters, the turquoise and coral is set in silver. But at the center of Zuni art is the fetish (an honor of certain objects in the belief of supernatural properties); bears, badgers, spirits, wolves, eagles, animal figures cut from stone or semi-precious stone, the smallest being 2 centimeters, and the largest meter high. “Fetishes make their spirit and special powers available to those who are near them”, explains Robin. Every fetish purchased at Keshi comes with a small bag of ground corn. The paths throughout Santa Fe are short – almost everywhere can be reached by foot, which is very un-American. Also the life of Maria’s fellow countryman, Colin Keegan, began by coincidence, and is now being led with the elan of a fulfilled dream. It began with a piece of land on which way too many apple trees were growing, in a way one would wonder what to do with all of the fruit. “Apple brandy” beamed Keegan. Calvados. But also whiskey in a Scottish still. In the meantime, he has received highest honors for his “high spirits”, with gold and silver medals. Like Maria, he could also not imagine himself returning to live in Europe. “There is a distance not only in the landscape, but also in people”, Colin Keegan said. Perhaps the two go together. At the end of the day, Maria shows me Canyon Road – that famous art street lined with galleries and sculpture gardens. As we wandered by life-sized cowboys, Indian figures, jewelry and ceramics, Maria said proudly “Artists in the area want to stay here, and they want to come here from everywhere in the world.” Such is the case with the Swiss writer Milena Moser, who fell in love with a cute adobe house on Canyon Road, and then made her home here. The second Swiss article in Ostschweiz am Sonntag is almost identical with a few edits and the addition of C.G Higgins Confections. Maria Johnson, 51, tall, blonde, and with lively eyes under dark eyebrows, has a loving nature in which she speaks of the city that lies about her. The sand-colored dice which are the adobe houses strewn about the desert landscape really evoke a harmony, as if the place was not built, but rather evolved. “There are few cities in America that are as strongly defined through history, and through the connection to the indigenous peoples of the land”, added Maria. She still remembers the moment 30 years ago quite well: When she was a young model, she saw the famous photo by Edward Curtis “The Vanishing Race” from 1904. It shows a long ago glimpse of Indian inhabitants who ride slowly out of the picture. “This picture must be made in a place that has soul”, such are her thoughts. Thus, she moved her career from England to New York, knowing that she was seeking something other than the glitzy world of modeling. “I was leading an unquiet, nomadic life, and promised myself that I wouldn’t give up until I found a place to live that would have a sense of spirit.” At that time, she traveled to where the photo was from – to Santa Fe. That was that. At the end of the 1980s, she purchased a home, continued to work as a model, and at the same time studied psychology and humanities at the college of arts. “New Mexico is also called ‘the land of enchantment’, said Maria as we slowly made our way down the mountain and towards Santa Fe. It is the oldest capital in the USA. In 1610, Santa Fe was declared to be the capital of “New Spain” by Spanish colonialists. Today, the little city with a population of 70,000 inhabitants has been long known as a city of artists. The mighty Governor’s Palace, a massive colonial building, lay along one side of the plaza. The Indian inhabitants sit on blankets under the long canopy day in and day out, and sell their jewelry. Overall, the architecture of the adobe houses is flat walled with rounded corners, in the style of the Indian pueblos. There are 19 pueblos throughout New Mexico. The famous “Santa Fe Trail” also ended there at the plaza. It was a trading route between Missouri and New Mexico that was founded in 1821. One can still feel the entire, exciting history in the atmosphere – in some old-fashioned hotel or also in the shops with colorful wares, accented by authentic Indian-made jewelry. Robin founded a co-op as a way of making Zuni art more public. Today, the two ladies run the shop, and are able to obtain fair prices for the Zuni people. It is those people like Robin that Maria brings to her blog santafeselection.com; those who are dedicated with initiative to their operation, those who before anything oblige themselves to have solidarity with the origins of Santa Fe and its inhabitants, and to do so with a soulful spirit. The windows are full of filigreed “petit-point” art, which is typical of the Zuni. Like finely worked splinters, the turquoise and coral is set in silver. But at the center of Zuni art is the fetish (an honor of certain objects in the belief of supernatural properties); bears, badgers, spirits, wolves, eagles, animal figures cut from stone or semi-precious stone, the smallest being 2 centimeters, and the largest a meter high. “Fetishes make their spirit and special powers available to those who connect with them”, explains Robin. Every fetish purchased at Keshi comes with a small bag of ground corn. But now it is time for coffee. Just a few streets away, the aroma of coffee and chocolate wafts from “C.G. Higgins Artisan Chocolate & Chuck’s Nuts Originals” shop. We sink into the little coffee house chairs and let Chuck – white hair with steel-blue eyes – talk about how he began to decide on his choice of career, as he experienced it at the age of twelve. It was a small family business, in which he ate homemade “nut rolls” for the first time, and that awoke his ambition. He wanted to produce something just as fabulous himself. Chuck grew up in the Midwest, and he tried his luck in different places. But it is in Santa Fe where he found his happiness. “The people are somehow special here – perhaps we all live here in such good harmony because no one takes it for granted that we can live here.” One could spend a lot of time trying Chuck’s “Specials”: caramel-popcorn, or chili pecan brittle, raspberry truffles, or homemade ice cream. The paths throughout Santa Fe are short – almost everywhere can be reached by foot, which is very un-American. Also the life of Maria’s fellow countryman, Colin Keegan, began by coincidence, and is now being led with the elan of a fulfilled dream. It began with a piece of land on which way too many apple trees were growing, in a way one would wonder what to do with all of the fruit. “Apple brandy” beamed Keegan. Calvados. But also whiskey in a true Scottish style. In the meantime, he has received highest honors for his “high spirits”, with gold and silver medals. Like Maria, he could also not imagine himself returning to live in Europe. “There is a distance not only in the landscape, but also in the people”, Colin Keegan said. Perhaps the two go together. At the end of the day, Maria shows me Canyon Road – that famous art street lined with galleries and sculpture gardens. On the way there, she met up with a famous Indian artist, who was just returning from a market. He tells me that some artists, like himself, concentrate on a single motif, his “power animal” being the owl – and he carefully un-wrapped a gleaming black figurine to show to me. As we wandered by life-sized cowboys, and Indian figures, jewelry and ceramics, Maria said proudly “Artists in the area want to stay here, and they want to come here from everywhere in the world.” The Swiss writer Milena Moser moved here a short time ago, and lives somewhere nearby. The call of Santa Fe even made it across the sea to Zurich.